Just the same in this office application we have two new versions.Build by the Microsoft Company, actually three versions, namely MS-OFFICE 2003, 2007, and 2010. From office 97 versions they produced the 2003 new versions of both word processing application, electronic spreadsheets, and presentation package.These are the MS- WORD, EXCEL, and POWER POINT.If we noticed, the 97 versions and 2003 its just look alike, meaning we don't worry to use the User Interface (UI). Because they have the same position of there buttons of the three most basic toolbars that we used.But unlike the two other new versions the 2007 and 2010 is the most very different.Because they added more enhancements of the User Interface and the features of the applications. So therefore, the basic of the user is to identify first the part of the User Interface.Such as the MS-EXcel UI, so that to familiarized the around of the applications. 1. Control Tool Box- this buttons are used to close windows, restore or maximized, and minimized the application window. 2. Title Bar- use to notify the filename of your document after saving it and the name of your office application. 3. Menu Toolbar- use to select command application using the customized drop/down window in various applications, such as the format menu. 4. Formatting Toolbar- use to change the appearance of the text, objects, mathematical application, alignment, currency, and decimals, etc. 5. Standard Buttons- compose of the most basic command application, presented by buttons to easily familiarize and click by the mouse pointer in single click and using the dialogue box as our communication to the application of computer. such as the NEW button for a new worksheet. 6. Name Box- this is situated in the left of the window.You will notice a letter combine with number.It is understood that indicated a certain intersection of the worksheet.The Letter signify the column and the number is row. 7. Editor Bar- this bar is next of the name box. Editor bar called also as the formula bar, meaning you can edit or change data and create logical formula using this bar.But you can use actually the worksheets as editor by pressing the F2 key of your keyboard. 8. Column Header- they are alphabets situated and underneath of the formula bar.It is represent the number of columns in a worksheet.It is composed of 256 columns in 2003 version.You can count how much the number of columns in single worksheet by holding CTRL + right arrow key of the keyboard. 9. Row Header- they are numerical numbers, from 1-104856 rows in 2007 version.You can count how much the number of rows in a single worksheet by holding CTRL + Down arrow key. 10. 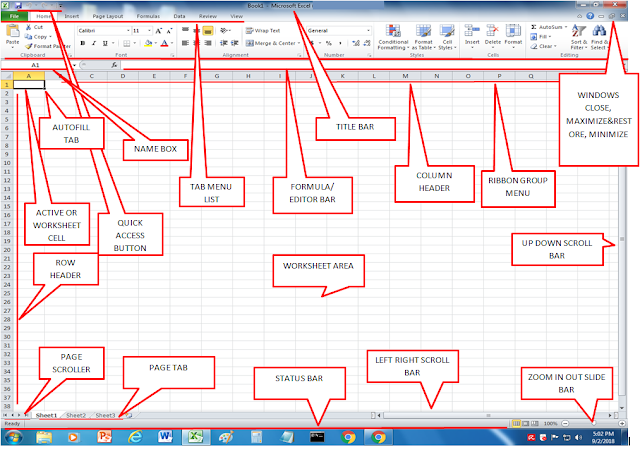 Worksheet Cell- its just bolded rectangle position normal in A1 once you open your MS-EXCEL.This is use to refer the data in your applications.Meaning, once you type your data, the number or text will position inside the worksheet cell in the different intersection of the worksheets application. 11. 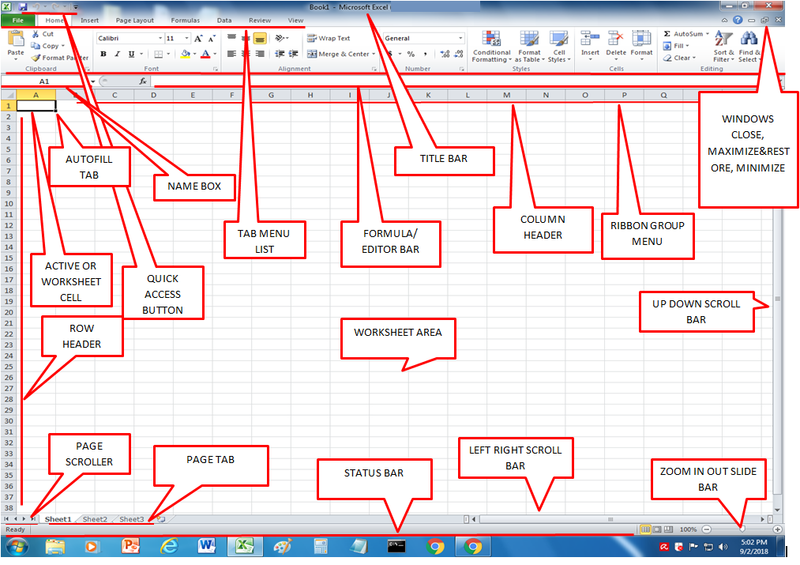 Autofill Tab- its a for of a box situated in the below right portion of the worksheet cell.Its use to perform application automatically using the drag of the mouse.Such as to perform logical calculation of the single column of the worksheets.Such as calculating or adding the numbers using the logical formula.The date, year, month, and the numbers in series. 12. Tab Buttons- this tabulated buttons is used to name the single worksheets in single workbook.Normally as default, it have three tab sheets that you can rename and adding it by pointing your mouse cursor in a tab sheets and use the right click of your mouse. 13. Worksheet- it is the wide area of your window application.Its is the spreadsheet paper literary.That simulated in electronic spreadsheet application.It have composed of vertical and horizontal grid lines to form an intersection of the worksheet. 14. Trail buttons- its just a form of a four arrows situated left side of the tab sheets buttons.It use to move or switch the entire worksheet in a single workbook by clicking it by the mouse pointer. 15. Vertical Scroll Bar- it is situated right side of the worksheet.It is used to move up/down of the worksheet or page in the application. 16. Horizontal Scroll Bar- it is situated right of the tab sheet button.It is used to move the worksheet or page left and right of the application. 17. Zoom In Zoom Out Sliding Bar- it is situated right/down in MS-Excel 2007 application window.It is use to increase/decrease the size of the worksheet.